Laptops have become an integral part of our lives. It has become impossible to live without them. Though a majority of the American population owns a laptop, repairing one isn’t something that everyone can do. Not only individuals, but most business owners and tech heads too fail to get a laptop up and running once it starts malfunctioning. Though minor issues can be solved with a little bit of guidance and knowledge, the same cannot be done when the problems are too technical or involve expert knowledge. That is exactly where Community Computer Services comes in. Ample experience – A laptop is quite a valuable electronic, and you would want nothing but the best when you are looking to repair your laptop. Community Computer Services promises just that. They have more than 25 years of experience to speak for them and over the years they have managed to serve their clients with a variety of repair services HD replacements, jack replacements, keyboard replacements, LCD repair and a lot more. You can rest assured that whatever problem you may have will be solved quite easily by their technicians. Time saver – Not only do they assist you with hardware problems, but also provide a plethora of other services like virus or malware removal, anti-virus installation, OS upgrades, data back backup and transfer and a lot more. This makes them a one-stop solution for all your laptop and computer related needs, thus eliminating the need to call in other experts to help you. This obviously saves a whole lot of time and money. 100% satisfaction – Community Computer Services being a family-run business is quite different from many other laptop repair companies that are interested only in money. But at Community Computer Services, you can expect the friendliest of the staff who are trustworthy and knowledgeable. They will provide every sort of assistance that you may need and ensure that you are totally satisfied with the service that you get. The leave no stone unturned to make sure that their client’s needs have been satisfactorily met. Guarantee – Not only does Community Computer Services offer impeccable service to their clients, but also offer a guarantee on the parts that they use and the service that they possible. The guarantee period for both is 7 days which means that you can peace of mind for full week. If any issue crops up during this period, you will be covered by the guarantee provided by Community Computer Services. So, all in all, opting for Community Computer Services for your laptop and computer repair needs is the best decision that you can take. So, do not hesitate if you have an issue with your laptop and visit Community Computer Services immediately. 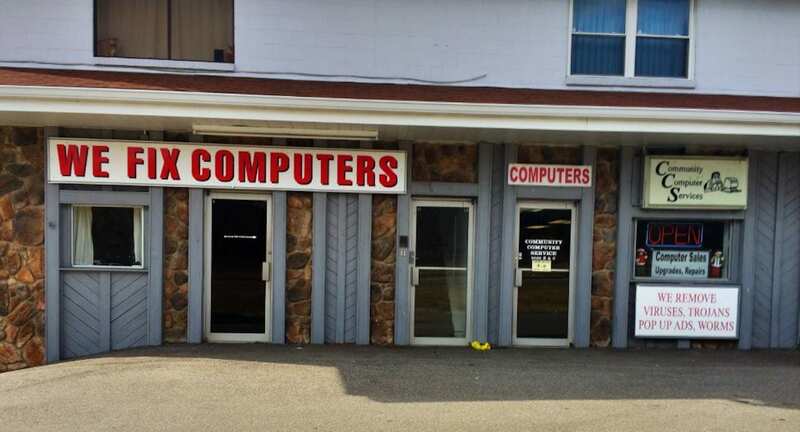 They are a trusted family owned computer repair company. Check them out below. Why should you hire Community Computer Services rather than DIY?